Liwathon E.O.S. is the promoter of the planned Tallinn LNG Terminal project developed in cooperation with Port of Tallinn (the port authority) and in Muuga harbour, Tallinn, Estonia. The project is planned to be implemented in accordance with the market needs and security of supply requirements. Currently, the field investigation program is taking place, including thorough studies of the project feasibility, first phase technical design, permitting and negotiations on the Final Investment Decision (FID) terms with the project partners and other involved parties. Tallinn LNG terminal project will include LNG storage, truck loading, Security of Supply (SoS) element, unloading LNG carriers, (bunker) barge loading, connection to low-pressure and high-pressure natural gas grid >>> . 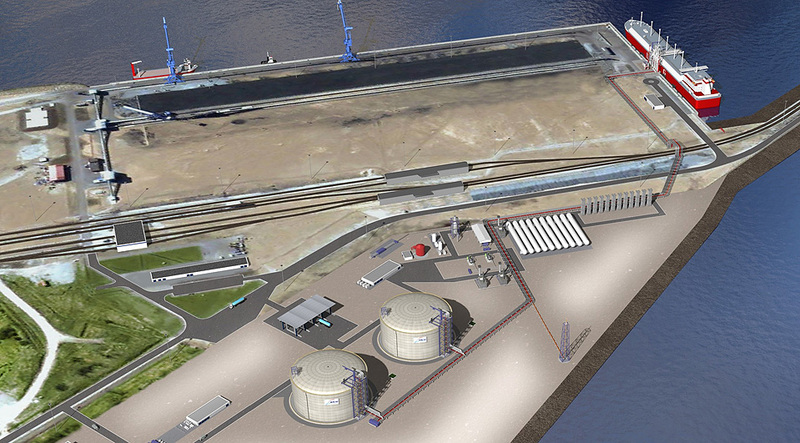 The plot for the Tallinn LNG terminal is favourably located in a major port and industrial HUB. The site has an excellent road connection and is situated about 300 m from existing deep water berths, about 150 m from rail shunting tracks, about 1 km from the low pressure grid, and about 13 km from the national high pressure grid.